A major programme of affordable home building by one of the region’s largest housing associations has been expanded to 700 homes across the North-east. New low-cost housing is set to be built across County Durham after a multi-million-pound announcement by the newly unveiled believe housing. 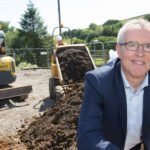 Formerly known as County Durham Housing Group, believe housing has revealed plans to expand its new-build programme by a further 150 homes, taking its total development programme to 700 new homes by 2022. An additional £18m will be invested in construction schemes, taking total spend on new-build homes to over £70m over the five-year programme. believe housing already provides affordable living for more than 18,000 families across County Durham. The expanded new-build programme will help to tackle high demand for affordable housing in communities throughout the region. It is expected that the expanded construction programme will support the employment of over 2,100 people and provide up to 23 apprenticeship opportunities. Chief Executive of believe housing, Bill Fullen (pictured above), said: “Our new home construction programme is not like private sector housebuilding. We work hard to include as many communities as possible in our new-build plans and focus on creating the right type of homes rather than quantity. “Each of our projects is genuinely tailored to the locations they are built in and the needs of the neighbourhood. That’s why we have built so many bungalows and have offered different opportunities such as Rent to Buy. The new-build programme has already seen homes completed in villages like Pity Me, Rookhope and St Helens Auckland as well as larger towns like Bishop Auckland and even the edge of Durham city centre. Work is also underway at sites in Bowburn, Peterlee and Seaham. Most of the new homes are being offered for affordable rent, with some being built as part of the Government-backed Rent to Buy scheme. Rent to Buy is designed to ease the transition from renting to buying a home by offering a reduced rent, usually around 20% below the market rate. The aim is to give people the opportunity to save for a deposit at the same time and buy their home after five years. believe housing is also investing heavily in existing properties, with a £138m, 10-year improvement programme that has already benefitted families in Brandon, Easington and Willington. The improvements range from new kitchens and bathrooms to rewiring, re-roofing and even upgrading footpaths.